Who is Rigden Djappo? References in Nicholas Roerichs works. Who is Rigden Djappo? References in Nicholas Roerich's works. RIGDEN DJAPPO. SHAMBALA SOVEREIGN. THE RED HORSEMAN. Searching for references to enigmatic Rigden Djappo, we have found information on the internet regarding famous artist and mystic Nicholas Roerich. So, who is Rigden Djappo? This mysterious and powerful character is not fully disclosed until today, whereas stories about the Red Horseman are available as legends and myths of ancient peoples. Publicly accessible information is given below. After the search for the sake of gaining a general understanding, we have run against a strange, but irrefutable fact: there are very few records of Rigden Djappo remaining. 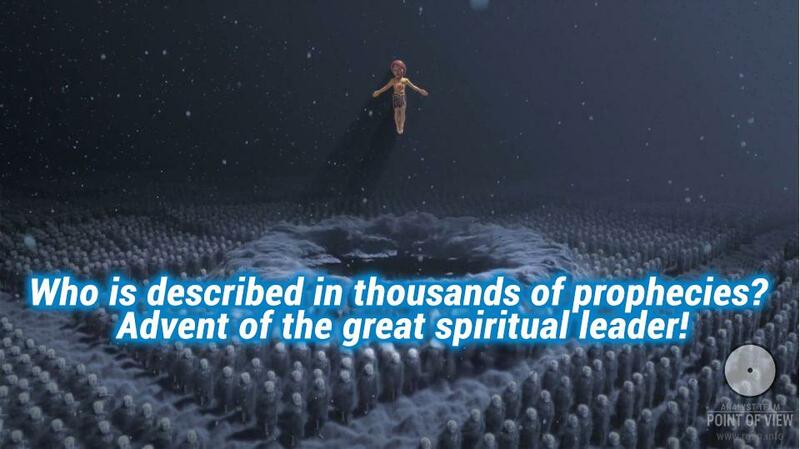 Understanding of the available records without a relevant spiritual basis provokes well-grounded doubts, whereas people who are totally unfamiliar with the subject regard such records as fantastic and illusive at all. We have established that the most direct and unmasked references are present in literary works and paintings by Nikolai Konstantinovich (Nicholas) Roerich (09.10.1874 – 13.12.1947), Russian artist, philosopher, writer, traveller, archaeologist, public figure, and founder of international cultural movements such as “Peace through Culture” and “The Banner of Peace”. 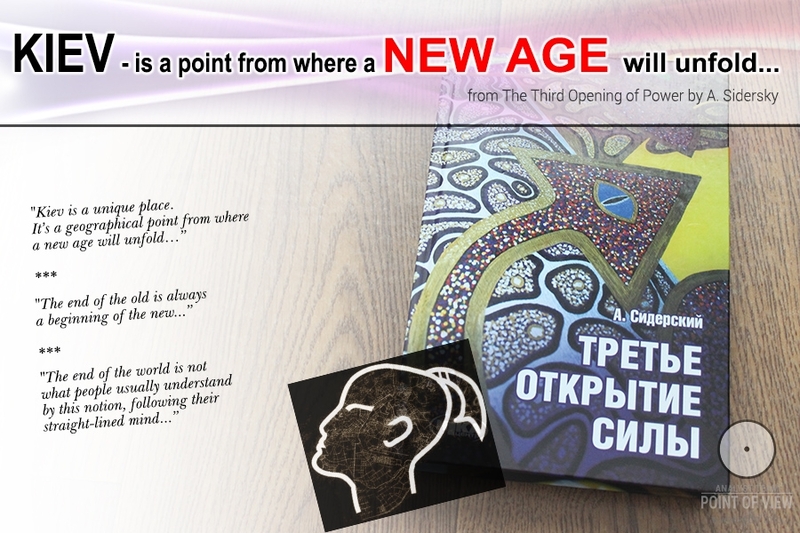 Nikolai Konstantinovich not just openly provides information about Rigden Djappo in his works, but also links the Red Horseman’s Personality with records of the advent of the Great Teacher expected in different religions and beliefs. In particular, he mentions the advent of “Messiah with the shining face of the Great Horseman on the Bridge of Worlds”, expected by peoples of Palestine, Syria and Persia; refers to legends of Arabia and Turkestan about Muntazar who will mark the beginning of the New World, to Hindu legends about Kalki Avatar, Buddhist legends about Maitreya, Altai records of the White Burkhan, etc. Multiple names, but single essence: the advent of Messiah and renovation of the world. - The Last Angel... (source of paintings). Kalki Avatar (1932) “Messiah, Maitreya, Muntazar, Mitalo, and the entire line of glorious names, diversely expressing one and the same innermost and most cordial aspiration of the mankind. Especially enthusiastic words are said by prophets about the future. Re-read all pages of the Bible, where the brightest human expectation is presented; read Buddha’s commandment about Maitreya. Look how brightly Muslims are telling about the future prophet, how wonderful India’s words are about the end of the dark age of Kali Yuga and the brilliant beginning of the white age of Satya Yuga, how majestic is Kalki Avatar’s image on the white horse! With the same cordiality, remote Oyrots expect the White Burkhan, and our Old Believers search for Byelovodye in Himalayas, making this difficult path for the sake of the future only. For the sake of the same bright future, a lama, with tears in his eyes, is telling about the treasures and power of great Rigden Djappo who will destroy the evil and restore justice. Geser Khan’s victories lead to the future as well. On every New Year eve, the Chinese light candles and pray to the Sovereign of the future. And the white horse is already saddled in Isfagan for the great Advent. If you want to touch the best chords of the mankind, start speaking of the future, of what human thinking is directed at even in the remotest deserts. Particular cordiality fills such aspirations for the World transformation. Maitreya the Conqueror (1925) “A strained expectation of the miraculous advent of future Buddha gains a fantastic solution in the last painting of the series: Maitreya the Conqueror. 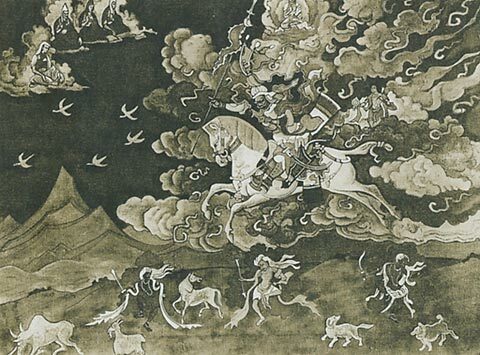 Over the mountain tops, in the fiery sky there rushes Rigden Djappo, the Shambala Blessed Sovereign, on his horse, leading his army to the final battle with the dark forces. 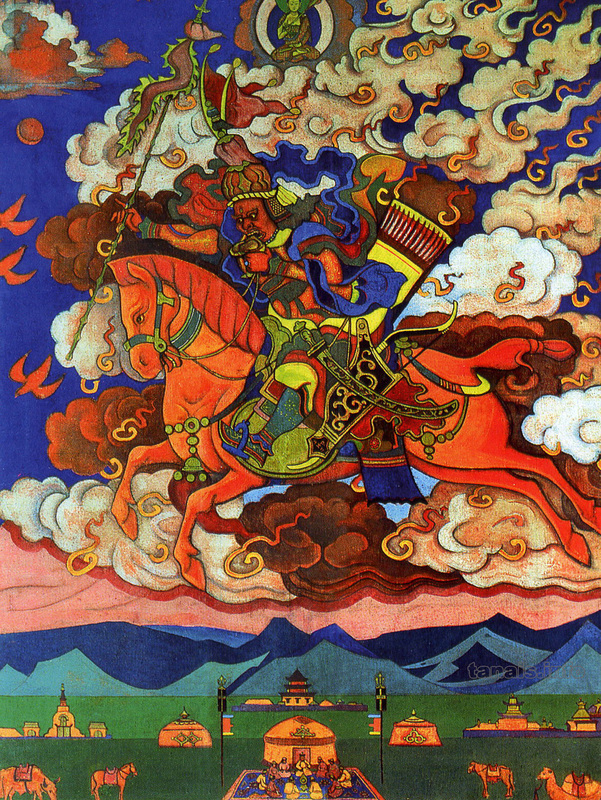 This is a real visual embodiment of the New Era legend spread across the boundless Asia territory.” On the painting Maitreya is symbolically depicted as a cloudy horseman, whereas the huge figure of Multi-armed Dukkar graven in the rock is what Roerich’s expedition saw many times on Tibetan paths. Against the background of majestic mountains panorama, there is praying man. 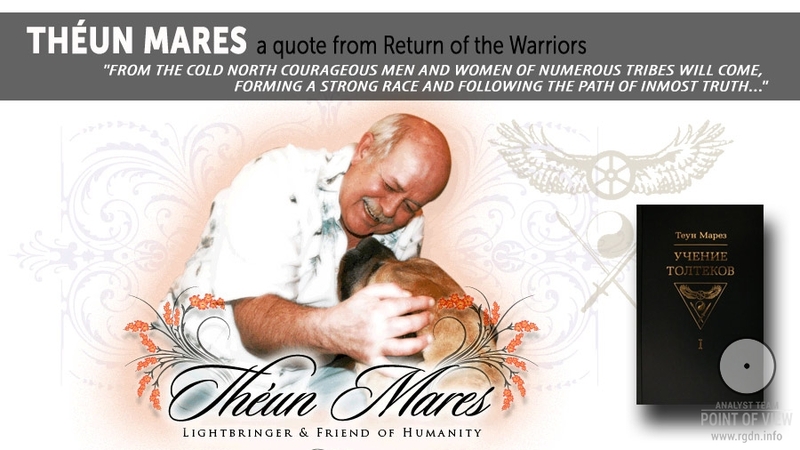 He is looking heavenward, where among the clouds there is a distinct silhouette of Sovereign Maitreya and other horsemen, the Sovereign’s warriors hurrying for the fight with dark forces for the establishment of Peace and Culture on the planet Earth. Unfortunately, we cannot post a better image of the painting (no images with higher resolution are available on the internet), since the location of the painting itself is unknown. 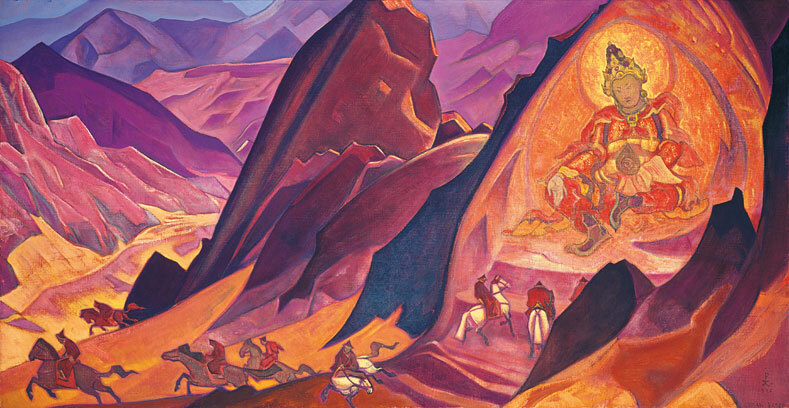 Shambala Is Coming (1926 or late 1925) An immediate reason for the painting creation was the ancient thanka (Buddhist icon) called The Red Horseman, which Roerich received as a gift in Ladakh. Therefore, the artist often called the entire series of paintings by this name. “On a red horse, with a red banner, the red horseman covered with armour is impetuously rushing and blowing the sacred shell. Sparks of scarlet flame are sprinkled from him and red birds are flying in front of him. Snow and Belukha mountain are behind him, and White Tara is sending her blessings. The assembly of great lamas is rejoicing. Under him, there are guards and animal herds as symbols of the place”. 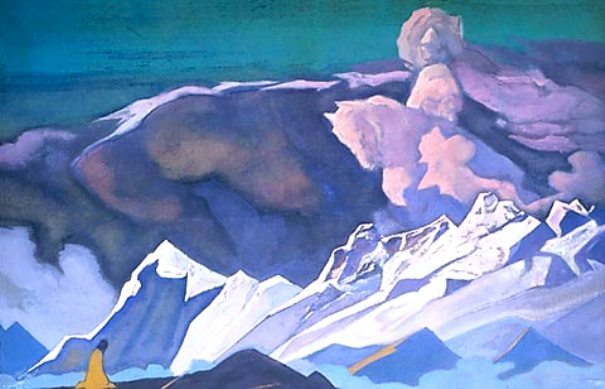 This is how Roerich described the image on the aforesaid thanka. The artist used the same plot, with preservation of stylistic peculiarities of Buddhist iconography, in Shambala Is Coming, the first painting of this series (painting location is unknown). 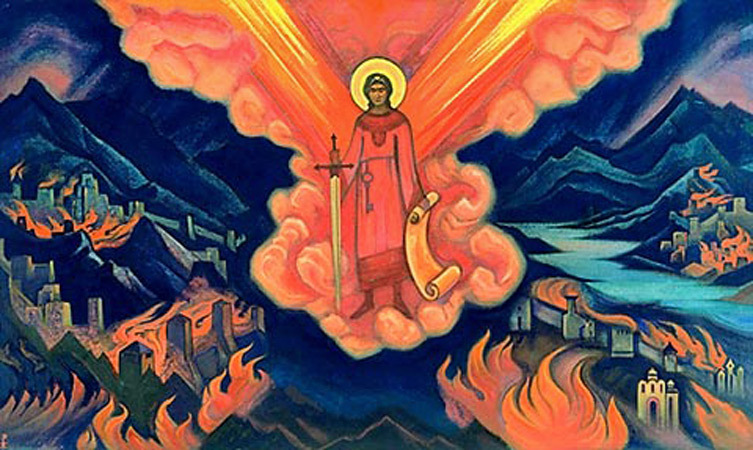 The painting was drawn by Elena Roerich’s prophetical dream. Nicholas Roerich created several paintings of the Last Angel. They were drawn either during or prior to the most terrible events that threatened his Motherland, therefore they were often prophetical by the message. The last Angel is adamantly standing amidst curling fiery clouds, above the Earth which is blazing with the last flame. The painting contains a message of retribution for demolition of cities, destruction of cultural monuments, and poisoning of the planet. The flame-coloured Angel holds a scroll in his hand, protecting and defending the genuine Culture, which scroll contains a list of persons who followed the spiritual self-improvement path, who will save themselves and enter the New Era of Light. The Angel also holds a purifying sword and a key to the New World of Beauty and Knowledge. 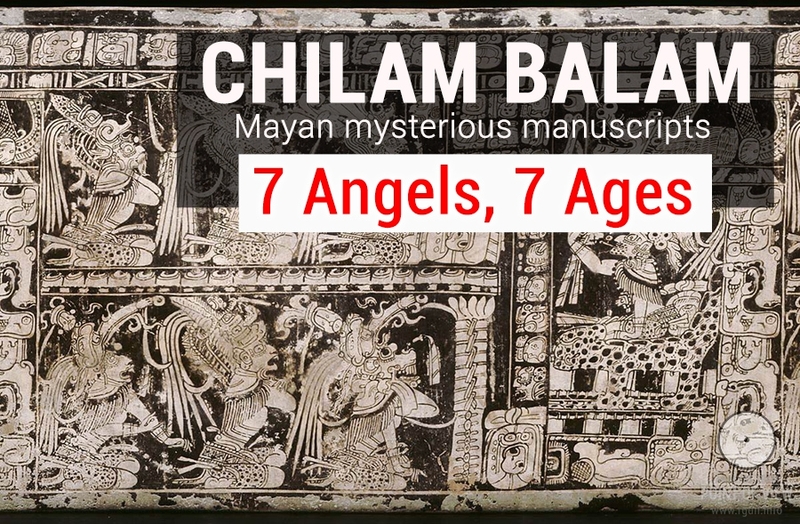 According to the Bible, 7 Angels arrived to the Earth, and now the last one is descending in the form of a chalice. He is as if in the Lord’s fiery palms. He has burning wings, Oriental face, and Russian clothes. His belt is a symbol of the highest power. This painting might not have immediate relation to Rigden Djappo, but its hidden sense of obvious: renovation of the world. 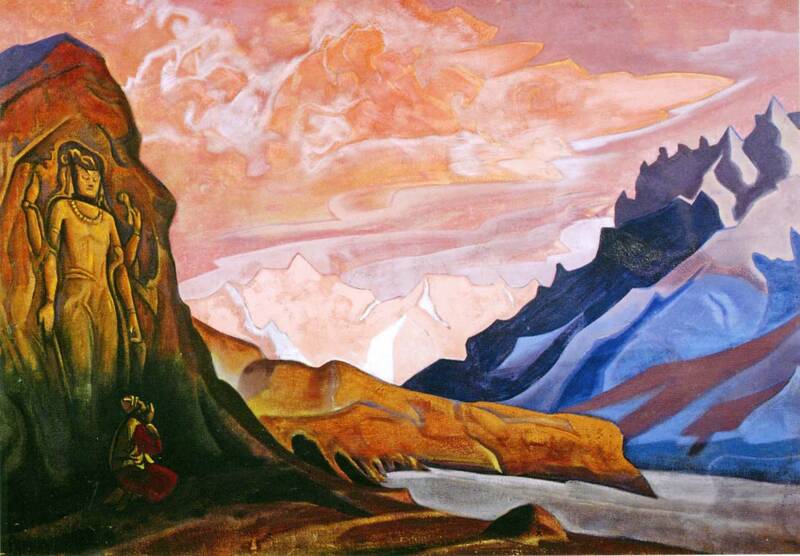 There are also records of Rigden Djappo in Roerich’s work Shambala Beaming. Here’s one of those: «Even Rigden Djappo himself sometimes comes in a human body. He unexpectedly shows himself in holy places, monasteries, etc., and communicates his Prophecies at time due. The Governor of the World attends the Temple at night or early in the morning, before the sunrise. He enters. All lights go on simultaneously by themselves. Some of the present recognize the Great Wanderer right away. Lamas gather respectfully and listen to his prophecies of the future with deepest attention. The Great Epoch is approaching. The Governor of the World is prepared for the Battle. Many signs appear. The Cosmic Fire is approaching the Earth again. Planets foreshadow the New Era. However, numerous disasters will take place before the New Era of prosperity sets in. The mankind will be tested over again, so as to verify whether their spirit has sufficiently evolved. Underground fire endeavours to unite with the Fire element of Akasha. If all good forces fail to join their powers, great disasters will be inevitable. 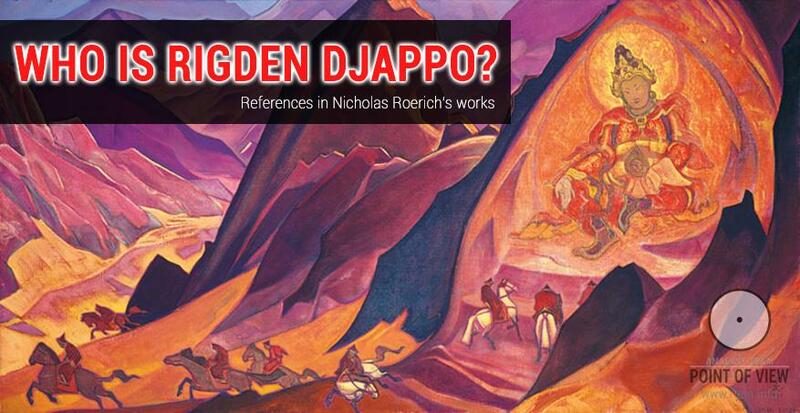 Having somewhat extended the knowledge of Rigden Djappo’s names mentioned by Nicholas Roerich in his works, it is certainly worth noting there is much in common in records and legends preserved by different people of the world. For instance, Kalki Avatar, or the White Horse Avatar is to be the last Avatar, the tenth incarnation of god Vishnu, according to Brahmans; Maitreya is to be the last incarnation of Buddha, according to northern Buddhists; Sosiosha will be the last hero and Saviour, according to Zoroastrian legends. As some sources indicate, when Vishnu (Kalki Avatar) comes for the last time, heavens will open wide, and he will appear as the Saviour, riding a white horse with his sword raised, and the horse will be the evil spirit’s shell, on which Vishnu will be riding until overpowering the evil spirit for the last time. With his sword Avatar exterminates enemies and destroys the unfair world, thus restoring dharma and preparing the future revival of the world. Who is Muntazar? He is Messiah glorified and expected in all countries of the Muslim world: Imam Mahdi, the Hidden Imam. According to the information available on the internet, Al Mahdi (Muntazar) is an actually existing person who is already present on the Earth, who lives among people and sees everything that takes place here, although he himself is not seen to anyone. “He evidences how sufferings of the oppressed, despair of the hopeless, evil of the oppressors are accumulated on the Earth. He observes all this close and from afar and waits for the hour to be able to offer his hand to every oppressed, every miserable, every hopeless, and to exterminate all oppressors without exception. This expected leader is destined neither to announce himself, nor to show himself to people, although he lives among them, waiting for the promised hour”. His advent will be a sign of the last hour approach. The idea that Rigden Djappo, the Sovereign of Shambala (the spiritual centre of the Earth) is the Messiah runs through all preserved records and sources; he is exactly the Avatar who comes to the Earth at the times of the world renovation, evaluates and decides the world’s fate. We will surely investigate the issue in more detail. Follow our further publications.